Select which thickness of sheet you require. Acrylic plastic sheets are durable, weather-resistant and longlasting. Used in a wide range of applications including signage, fabrication, shop fittings and displays to name a few. Acrylic can also be recycled. Polymech supply a range of Acrylic sheets in a wide range of colours and finishes. These sheets available online represent those that are carried in stock. Should you require other colours, please contact us and we can make arrangements for special orders for you. 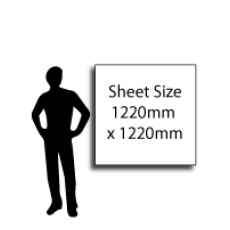 To order, start by selecting the sheet thickness you require. Then from the drop down list, select the thickness and the colour colour. When satisfied with your selection, click the 'Add to Cart' button. When you are ready to purchase, go to your cart to complete your purchase. Sheet thicknesses are available in 3mm, 4.5mm, 6mm and 8mm. Prices are shown in Australian Dollars (AUD) including GST. Shipping costs will be calculated for you at the Checkout.